It’s not every day that a novel practically writes its own review, n’est-ce pas? 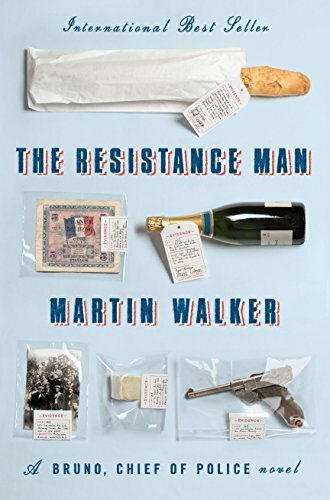 But there it is, on page 287 near the end of Martin Walker’s The Resistance Man, a police procedural featuring Bruno Courrèges, chief of police in St. Denis, France. Here’s the setting: At a pre-arranged meeting in a remote spot, Bruno at last comes face to face with the suspect in a mysterious homicide. Our hero, who (gasp!) had wanted to come unarmed to the meeting but was overruled by his boss, carries only a small pistol concealed in an ankle holster—which he promptly reveals (go figure) apologetically to the suspect who is armed to the teeth. All of this plays out as Bruno’s dog frolics at his feet. Yes, you heard right: To help him make the pinch, Bruno has brought along his dog—not a police dog, mind you, but a cute little basset hound named Balzac who loves everybody, sinner or saint, rap sheet or no. Tell me, says the suspect, who might be wondering if he has strayed into the wrong book, why did you bring the dog? And there it is, out of the mouth of one of the book’s own characters, and a felon at that, the truth, the quintessential essence of this novel, its raison d’etre, its appel en chef: Bruno Courrèges is indeed a strange kind of cop. But Vive la difference! Who else but a Gallic sleuth would make so many romantic and gastronomic side trips in his hunt for a vicious killer—side trips (it has to be said) that will perhaps be more engaging to readers than the manhunt itself? That’s not to say that the case is not interesting. It is, sort of. Nor is it to say that Bruno is a womanizer. He’s not. But he does like women, god bless him—and they like him. But what’s not to like? Bruno is single, employed, gentle and gentlemanly, loves the outdoors, sits a horse well, loves animals, appreciates—and prepares—good food, is congenial, polite, convivial, intelligent, thoughtful, and a loyal friend. In comparison, the Mike Hammers and Travis McGees of Bruno’s trade are uncultured louts who need to get a life (and some couth). And even those other European authors working the mystery genre—the Joe Nesbos and Stieg Larssons, for instance—might lighten up a bit. Does every case have to be operatic in pitch, red in tooth and claw, with pedal-to-the-metal pacing? From Martin Walker, the requisite answer would have to be, Non! A thousand times non! And many a reader will no doubt agree. The Resistance Man is a charming tale of French provincial life seen through the eyes of a likable and very human policeman. And to those making Bruno’s acquaintance for the first time: don’t be surprised if you come away from this book with a hankering to read another of the six or seven novels in this series—and maybe even planning a trip to France really soon. Robert Lamb is a writer who formerly taught creative writing and American literature at the University of South Carolina. He now lives in Pawleys Island, S.C., and writes full time. His latest novel is And Tell Tchaikovsky the News.